Fanatical has teamed up with PC Gamer to gift one of their fans with cool VR console and bundle of games! 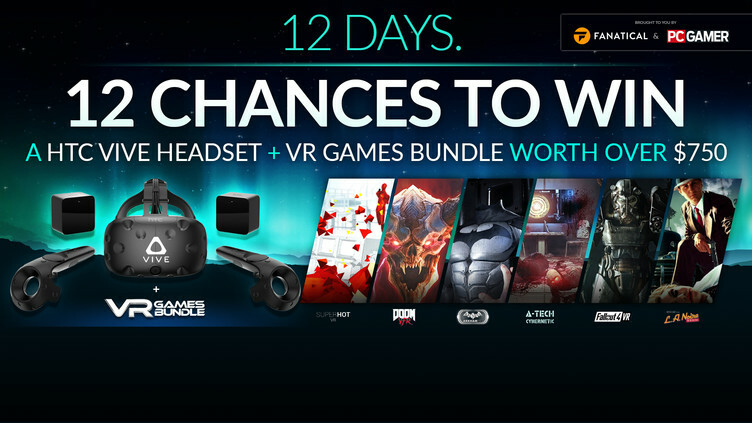 To enter in their latest HTC Vive and VR Games Bundle Giveaway grab your free entries by following few simple steps listed down below! Putting on the VIVE headset washes away the real world with fantastical experiences–from rec room-type games like ping-pong or pool to experiences spanning categories. SteamVR Tracking, stunning graphics, a 110˚ field of view, intuitive controls and HD haptic feedback provide an unparalleled sense of immersion. Viveport is the global virtual reality app store for VIVE, showcasing an ever-growing selection of VR experiences across a wide variety of content categories. Now, all Vive owners can start a free one-month trial of Viveport’s subscription service – the best way to experience virtual reality from a specially curated collection of titles for one low monthly price. Where will you go now? Winner will be notified by email at the email address provided in the Entry Information on or about 5 days after the random drawing. Potential winner must accept a prize by email as directed by Sponsor within 48 hours of notification.